This book tells the story of American modernism that has not been told in full before. not as a moment frozen in time, but an evolving legacy that adapts to contemporary life. Midcentury Houses Today takes on the unparalled concentration of residential modernism in New Canaan, Connecticut, and demonstrates how the houses are experienced and lived in today. featured in Midcentury Houses Today. " 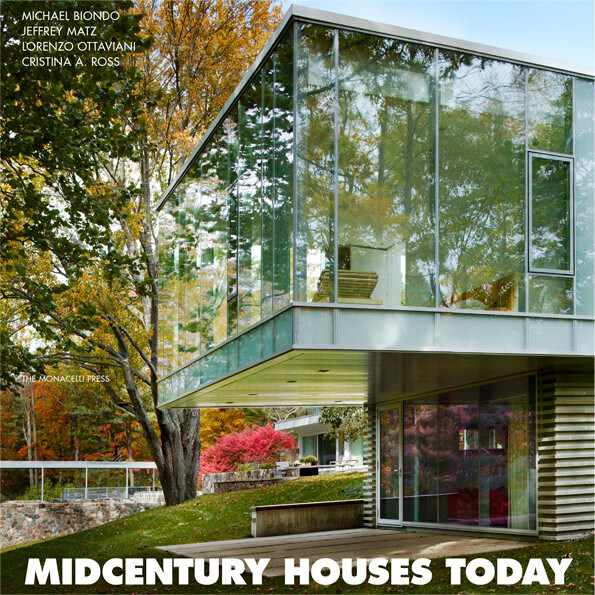 Published by The Monacelli Press, with an Introduction by John Morris Dixon, Midcentury Houses Today presents the unparalleled concentration of residential modernism in New Canaan, Connecticut, a site of fervent experimentation by some of the leading lights of the movement in the United States. This is where, in the 1940s and 1950s, Philip Johnson, Marcel Breuer, Landis Gores, Eliot Noyes, Edward Durrell Stone, and others promoted their core principles: simplicity, openness, and sensitivity to site and nature. There, they built houses that established architectural modernism as the ideal of domesticity in the twentieth century. Architects Jeffrey Matz and Cristina A. Ross, photographer Michael Biondo, and graphic designer Lorenzo Ottaviani present American modernism as an evolving legacy that adapts to contemporary life. Selecting a representative group of sixteen houses, they present each one in great detail: from the clean, minimalist look of the initial construction, to subsequent additions by some of the most significant architects of our time, and concluding with the way in which the house is lived in today. Voices of the architects and builders, original owners and current occupants combine to describe how the modernist residence is more than just a philosophy of design and construction, but also a philosophy of living.